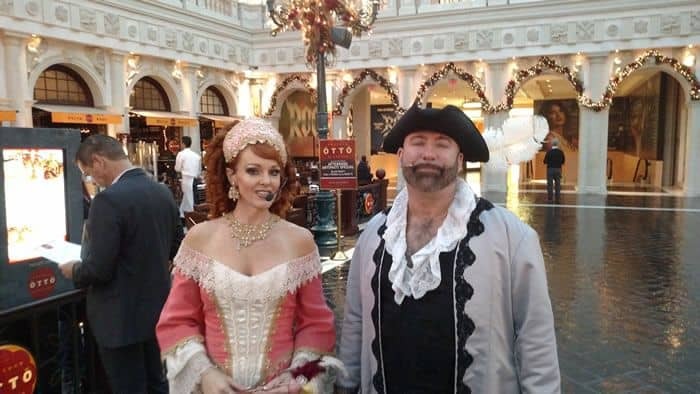 Streetmosphere is a free show in Vegas at the Venetian’s St. Mark’s Square with classically trained opera singers, a stilt walker, and performers. If you get there about 20-30 minutes before the show begins you can get a front row seat to the performance. While you’re there grab a gelato at nearby Cocolini’s to enjoy during the show. 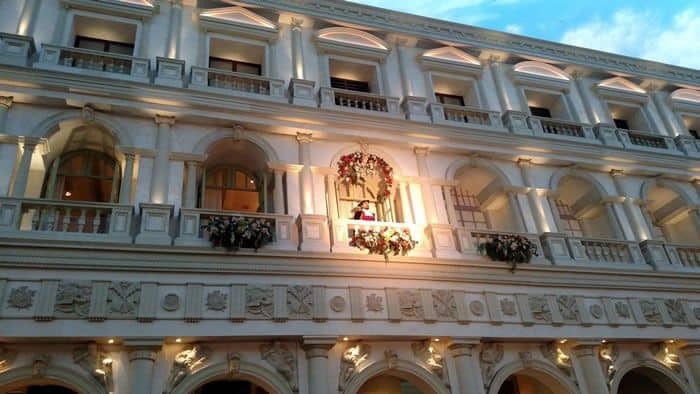 During the act, the male singer goes up to the balcony facade, while the rest of the performers are on the stage below. 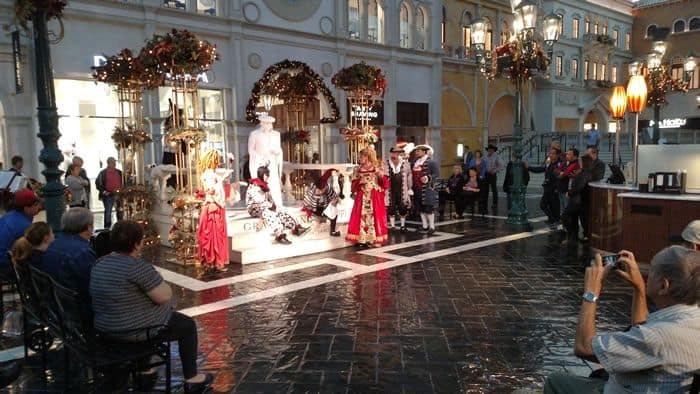 We were there in December so they added in a few Christmas songs in addition to their usual songs for “Carnevale di Venezia” – Carnival of Venice – an annual celebration in Venice. Gondolier March – 9:50 a.m. and 4:20 p.m.
Carnivale de Venezia St Mark’s Square: Noon, 1 p.m., 2 p.m., 4 p.m. 5 p.m. and 6 p.m. 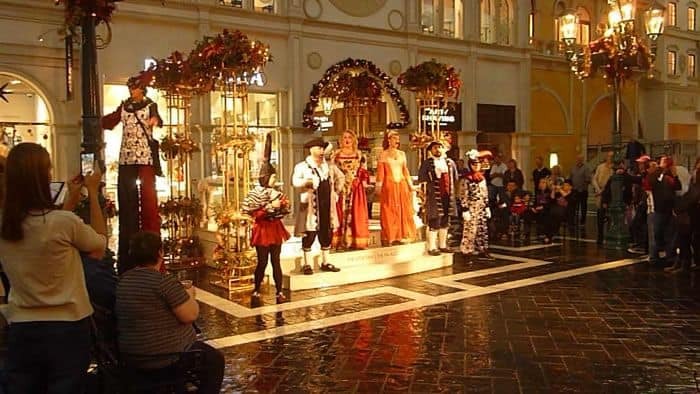 Living Statues on display: 10 a.m. – 6 p.m. and near Ann Taylor: Noon – 8 p.m. 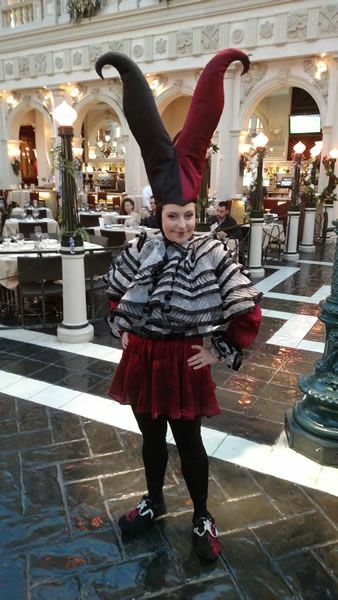 Entertainers such as musicians, jugglers, or improvisational troupes who perform in public areas of theme parks. 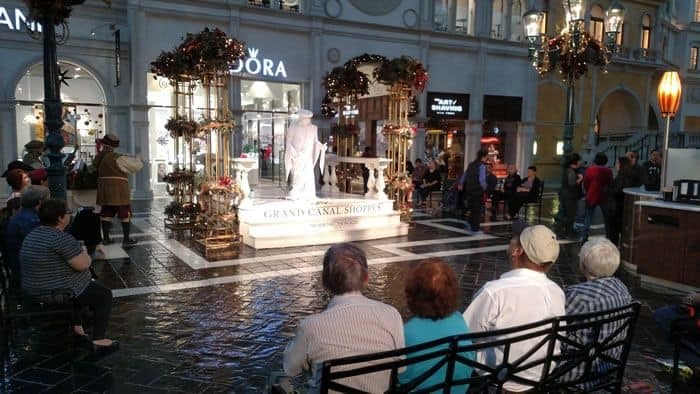 The Living Statues are costumed performers that look like white statues. They stand perfectly still, and only move when you lay money at their feet. It’s incredible to just sit and watch them. The Living Statues are in St Mark’s Square and near Ann Taylor in the Grand Canal Shoppes.